Fortinet FTNT posted earnings per share of 59 cents and revenues of $507 million, easily topping the Zacks Consensus Estimate of 51 cents and $496 million, respectively. On a year-over-year basis, earnings increased from 32 cents in the year-ago quarter while revenues were up 22%. The company projects revenues in the range of $465–$475 million and earnings per share of 37-39 cents for the ongoing first quarter. For 2019, it guided revenues in the range of $2.06-$2.10 billion and earnings per share in the range of $2.05-$2.10. Symantec’s SYMC earnings per share came in at 44 cents, topping the Zacks Consensus Estimate of 39 cents but down from the year-ago quarter figure of 49 cents. Revenues of $1.22 billion grew 0.7% year over year and outpaced the consensus mark of $1.18 billion. For the fourth quarter of fiscal 2019, the company expects revenues in the range of $1.19-$1.22 billion and earnings per share in the range of 37-41 cents. For the full fiscal year, Symantec raised its revenue guidance range from $4.67-$4.79 billion to $4.76-$4.79 billion and EPS guidance from $1.47-$1.57 to $1.57-$1.61 (see: all the Technology ETFs here). Proofpoint PFPT outpaced the Zacks Consensus Estimate by 16 cents for earnings and $6 million for revenues. Earnings per share climbed 37.8% from the year-ago quarter while revenues jumped 35%. For the first quarter, the company expects revenues in the range of $198-$200 million and earnings per share in the range of 31-35 cents. For the full year, Proofpoint expects revenues of $870-$874 million and earnings per share of $1.60-$1.67. Check Point Software Technologies CHKP posted earnings per share of $1.68 and revenues of $526 million, outpacing the Zacks Consensus Estimate of $1.63 and $517 million, respectively. On year-over-year basis, earnings grew 6% while revenues were up 4%. For the first quarter of 2019, the company expects earnings per share in the range of $1.28-$1.34 and revenues in the $460-$480 million range. It also projects revenues of $1.94-$2.04 billion and earnings per share of $5.85-$6.25. 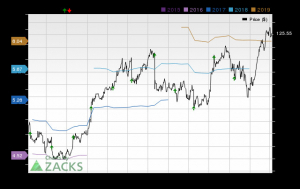 The strong performance is expected to continue with other renowned industry players like CyberArk Software CYBR, Palo Alto Networks Inc. PANW, Splunk Inc. SPLK, Qualys Inc. QLYS and SailPoint Technologies Holdings Inc. SAIL slated to report in the weeks ahead.